When renovating a kitchen, keep in mind the classic kitchen triangle. It's the most basic design concept, but one that still applies to all kitchens. It's also a simple "shortcut" to kitchen design: if you follow this, you've automatically solved a host of other kitchen design problems. The kitchen triangle regulates workflow. 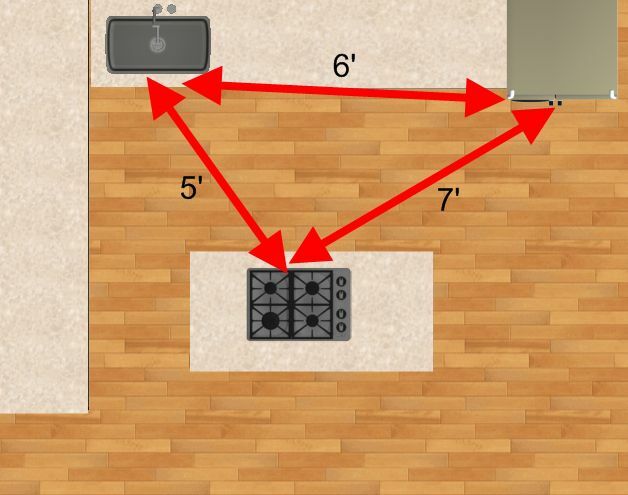 The idea is that the cook should be able to move unimpeded between three points – sink, stove/oven, and fridge – and the distances between those points should not be far. Sink: Primary sink usually located on the perimeter of the kitchen, though sometimes it may be located on a kitchen island. Supplementary sinks are not included in the triangle. Stove/Oven: The assumption is that this is a combined stove/oven, or if separate, the two are located within 2 to 3 feet of each other. You can fudge it a bit with a wall oven located out of the triangle since baking tends not to be a frequent kitchen activity. If you do happen to be an avid baker, then make certain that the wall oven is part of the triangle. Refrigerator: The fridge is the least important point of the triangle since it's assumed that you will not be constantly ferrying items back and forth from it. If one point can be a little bit farther away, it will be the fridge. One tip: make sure that the door of the fridge opens into the triangle. Triangulation won't ensure a smooth-flowing kitchen all by itself; you also need to consider spacing of the triangle. When you add up the three legs of the triangle, they should not total more than 26 feet, with no leg more than 9 feet and no leg less than 4 feet long. Galley Kitchens Are Beautiful. See How They Can Work For You.